ST. JOHN'S, N.L. 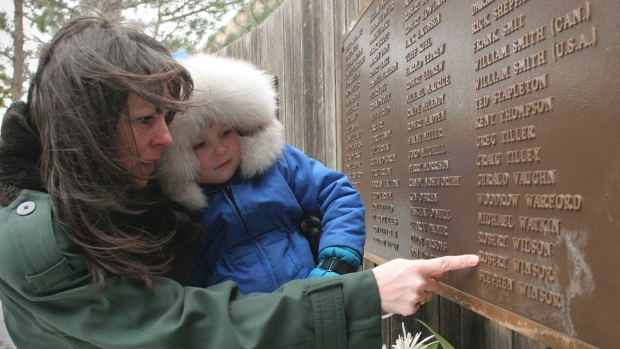 - A remembrance service is planned today to mark the anniversary of one of the worst disasters in the history of Newfoundland and Labrador. It was 34 years ago today -- during the early morning hours of Feb. 15, 1982 -- that the Ocean Ranger drilling rig sank in a violent storm about 300 kilometres east of St. John's. Eighty-four crew members, many of them from Newfoundland and Labrador, perished that day. A royal commission report cited a chain of events that led to the sinking of the semi-submersible rig. Sea water rushed through a glass portlight and soaked an electrical panel, shorting out controls for ballast gauges and pumps. A memorial prayer service for those lost at sea will be held at St. Pius X Church in east end St. John's.